Customers asked for it so here it is, The "Blind" Mo-Reaper. Finally! …A quality-built muzzle brake for the Ruger Mini-14 Rifle is now available from the makers of the famous Mo-Rod Barrel Stabilizer. The "Blind" Mo-Reaper’s unique lateral port design redirects muzzle gases away from the shooter, providing for superior recoil control. Constructed from lightweight, high-quality, hard-anodized 7075 T-6 Billet Alloy for reduced weight and superior strength, the"Blind" Mo-Reaper utilizes the same roll pin location on the barrel as the factory front sight, making it a ready-to-fit accessory. The "Blind" Mo-Reaper’s alternating rows of gas-dispersing ports limit muzzle rise, while maximizing noise deflection. It disperses gas and sound equally to both sides, but will not blow gases downward, thus eliminating the irritating dust cloud when shooting from the prone position. For an extra measure of rugged protection, the Mo-Reaper is finished with an industrial-grade hard-anodizing treatment. Mini 14 Straight - Early 580 series with pencil barrel. 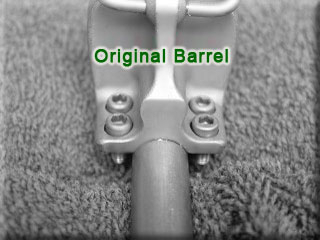 This model may require that you cut a new roll pin slot on your barrel for proper fitment. Q: Is the Mo-Reaper available for my version of the Mini-14/Mini-30? A: Yes, the Mo-Reaper is available in several configurations, and we can fit all versions of the Mini-14 and mini-30 except for the factory tactical Mini-30. Q: What material is used to manufacture the Mo-Reaper? A: The Mo-Reaper is manufactured from lightweight, aircraft-quality, hard-anodized Billet 7075 T-6 Alloy for reduced weight and superior strength. Q: Can I purchase the Mo-Reaper without the hooded sight, or just the hooded sight without the muzzle brake? A: The Mo-Reaper was designed as a single integrated unit, and is CNC-machined from a single block of 7075 alloy. It is available only in this integrated configuration. Q: Can I mount the Mo-Reaper myself, or do I need a gunsmith to install it? A: The Mo-Reaper was designed for the do-it-yourself rifle owner to install. Installation is not difficult, and a thorough instruction sheet is included, which also covers the removal of the factory front sight. Q: Does the Mo-Reaper thread onto my Mini-14 tactical version? A: Although we can fit the factory tactical Mini-14, the barrel threads are not utilized. The unit is secured by a roll pin across the top of the barrel, and two set screws on the underside. Q: How will the Mo-Reaper effect my rifle’s performance? A: The Mo-Reaper’s alternating rows of gas-dispersing ports limit muzzle rise, while maximizing noise deflection. The Mo-Reaper enhances accuracy by providing the shooter with a pin-point sight picture that does not obscure the target like the thick factory front sight, allowing for lightning-fast target acquisition and engagement. The complete cylindrical hood feature keeps glare off of the perfectly centered ball-type sight post, providing an outstanding sight picture. Q: I shoot from the prone position. Won’t the ports kick up dust from the ground? A: The Mo-Reaper disperses gases and sound equally to both sides, but will not blow gases downward, thus eliminating the irritating dust cloud when shooting from the prone position. There are no ports on the underside. Q: Can I replace the sight post with a different style? A: Yes, but we recommend you try the ball-type sight post first. It was specifically selected as the most compatible sight post for the Ruger sight system, and it is especially a nice match for the factory rear sights. 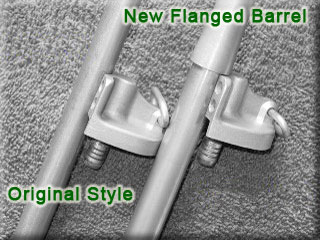 The ball-type sight post has standard AK-style threads, and is produced for Mo-Rod.com by KNS Precision in Texas. Q: When I went to install the Mo-Reaper, the roll pin hole did not line up with the barrel slot on my rifle. A: This indicates a mismatched application. You need to exchange it for the proper unit. Be sure to provide all of the specifics about your rifle to the retail distributor. Q: When I installed my Mo-Reaper, and inserted the roll pin, the unit is somewhat loose. Is this normal? A: In most cases, this is somewhat normal. The factory front sight is pressed onto the barrel before the roll pin is inserted. The Mo-Reaper is not designed to be pressed on like the factory sight, so it will typically be slightly loose with just the roll pin installed. 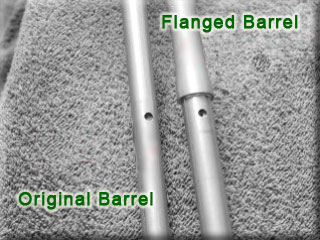 The roll pin prohibits forward creep, and must be well-centered across the top of the barrel. After the unit is vertically aligned, the two set screws may be tightly secured on the underside. Thread locker (medium strength) is recommended for these set screws. The Mo-Reaper must be installed with the roll pin and both set screws. Failure to include all three anchor points may result in a unit failure when firing. Q: Will 7075 alloy hold up to normal use of the rifle? A: Yes. This extremely durable material is used by other muzzle brake manufacturers also. Our hard-anodizing process provides an extra measure of hard-wearing rugged protection, ensuring the Mo-Reaper will endure years of use. The Mo-Reaper is a hooded front sight manufactured for the Ruger Mini-14 and Mini-30 Rifles. The unit is integrated with a precision-designed muzzle brake. 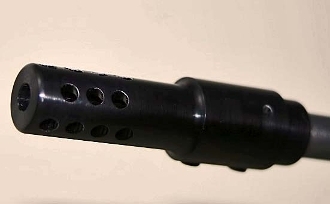 The muzzle brake is fitted to the muzzle of the rifle to redirect propellant gases, for the intended effect of countering both recoil of the rifle, and unwanted rising of the barrel (aka muzzle rise) when firing. The Mo-Reaper’s lateral port design also redirects muzzle gases away from the shooter, providing for greater recoil control. The Mo-Reaper is designed with alternating rows of angled gas-dispersing ports, which maximize noise deflection. It disperses gas and sound upward, and equally to both sides, but will not blow gases downward, the intent being to eliminate the dust cloud often created when shooting from the prone position. The Mo-Reaper is finished with an industrial-grade hard-anodizing treatment. The Mo-Reaper was designed purely as a front sight and muzzle brake, and is not a flash hider. Flash hiders have a different design and purpose than a muzzle brake. Even though a flash hider is mounted on the muzzle of a rifle in similar fashion as a muzzle brake, the terms flash hider and muzzle brake are not synonymous.